The Indian team to IOI-2012. Question papers from ZIO-2012, ZCO-2012 and INOI-2012. We thank all the organizations that have supported the Indian Computing Olympiad in 2012. Sasken Communication Technologies Ltd sponsored the 15 day training camp from 18 June–2 July, 2012 in Bangalore to choose the final team and also provided full financial support for the team's trip to IOI-2012. The International School Bangalore made their congenial campus available to us for holding the training camp in June–July. The International Olympiad in Informatics, 2012 (IOI-2012) was held at Sirmione, Italy in September, 2012. One Indian student won a bronze medal. The Leader and Deputy Leader of the Indian contingent will be Prof K Narayan Kumar, Chennai Mathematical Institute, Chennai, and Prateek Karandikar, Chennai Mathematical Institute, Chennai, respectively. 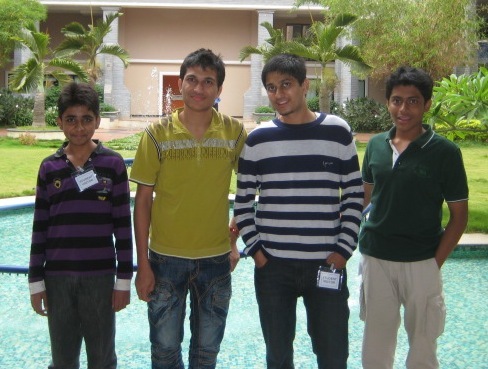 The team was chosen at the end of a 15 day training camp, held in Bangalore during the period 18 June–2 July, 2012. The Indian National Olympiad in Informatics, 2012 (INOI-2012) was held on Saturday, 21 January, 2012. Of the 235 students who participated in INOI-2012, 23 students have qualified for the training camp in June, 2012 to select the Indian team for the Internationals Olympiad in Informatics, 2012 (IOI-2012). The Zonal Computing Olympiad 2012 was held on Saturday, 26 November, 2011. Of the 61 students who participated in ZCO-2012, 15 students have qualified for the Indian National Olympiad in Informatics, 2012 (INOI-2012). The Zonal Informatics Olympiad, 2012 (ZIO-2012) was held at 40 centres in India and West Asia on Saturday, 19 November, 2011. Of the 8048 students who wrote ZIO-2012, 253 students have qualified for the Indian National Olympiad in Informatics, 2012 (INOI-2012). Testdata for Problem 1, Triathlon. Testdata for Problem 2, Table sum.